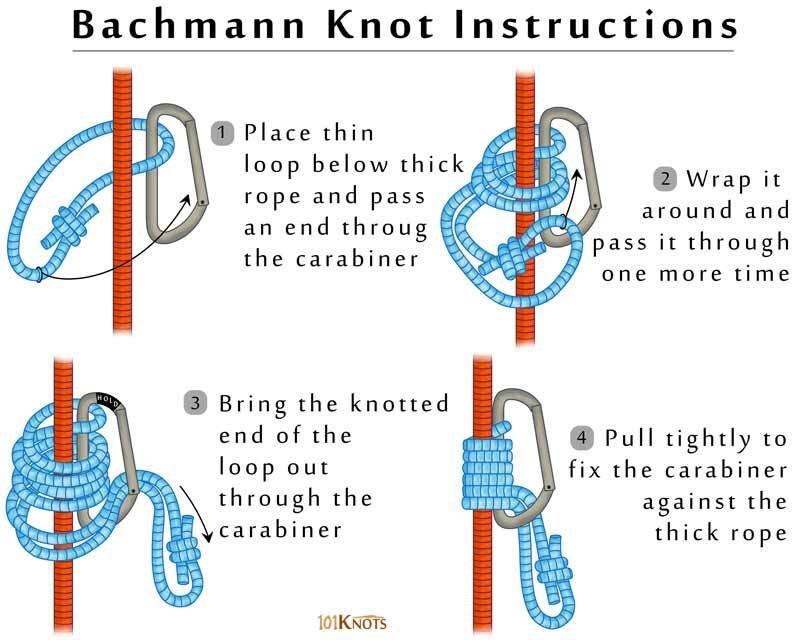 Bachmann knot is a friction hitch that grips the rope and provides support in climbing. The need for a round cross-sectioned carabiner to tie the knot visually differentiates it from the Prusik knot. Though it does not really matter whether the carabiner is locking or not, a locking one is preferable as you can grab it to move the hitch. 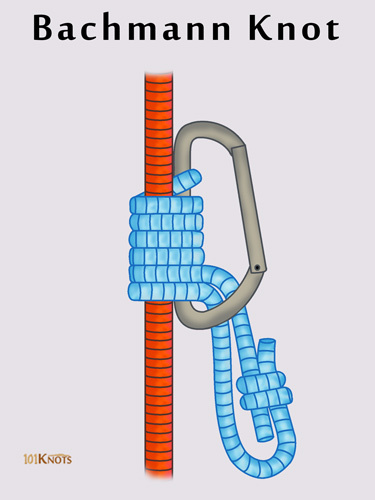 First, make a loop with a length of rope (no more thick than half the diameter of the main line) tied with the help of a double fisherman’s knot. Clip the sling to a carabiner before locking it off. The use of the carabiner helps in the easy movement of the hitch, especially if you are wearing gloves. Functions similar to the Klemheist knot in the sense that it works when pulled only in one direction and the weight should always be applied downwards. To undo the knot, unclip the top loop, hold on to the carabiner and free the cord by pulling. Never incorporate the double fisherman’s section of the loop into the wraps of the knot lest it decreases its effectiveness. Never grip the carabiner to apply load as it can result in slipping. Serves as a backup for hoisting up a casualty by the aid of a pulley system. Emergency ascending of a rope. Advantageous when the friction hitch needs to be replaced often or urgently or when it is required to be self-tending as in crevasse and self-rescue operations.